It’s only in the prototype stage, but the research group behind it are perfecting how to deliver sensation to video game players. They’ve started first with the hands and use vibrating devices to create the effect. Weird? Definitely. The picture above? 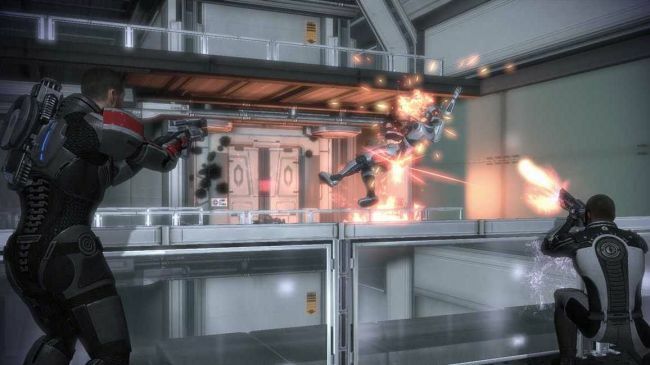 In case you didn’t recognize it that’s a scene from Mass Effect 2 where Shepard and this other guy are frying robots. It’s quite appropriate since the actual photogrpahs of this experimental sensation tech are quite boring. Watch the video below to see what we mean. Just a quick summary: In the video, the lady is explaining the research in brief. As shown, the actual contraption that gives the vibrating signals is rather clunky. But it’s feasible. As to whether it will ever hit the mainstream and shake up the gaming industry, who knows? If this tech ever matures, it would be a nightmare slogging through games like Bulletstorm or Call of Duty where players can’t avoid taking hits. What about giant explosions? All we can say is: ouch.